Jaroo is like Hulu but with 100% more Captain Lou Albano. A new cartoon-focused online viewing destination called Jaroo.com launched last week, and while it seems to be focused on younger children for now, it does have some content that could interest videogame fans. Jaroo is hosting classic episodes of The Super Mario Bros. Super Show!, The Legend of Zelda, Captain N, and Sonic Underground. These shows are far from the most compelling cartoons in existence, but they do have their own special places in videogame history. Of note here is The Super Mario Bros. Super Show!, launched in 1989. 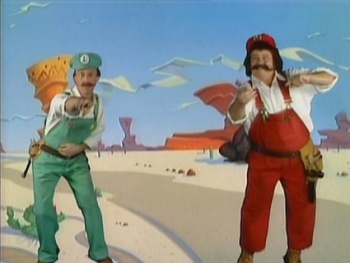 It featured Mario — played by the late Captain Lou Albano — and Luigi — played by the Albano-overshadowed Danny Wells — in live action skits interspersed between animation shorts. The animation looks pretty bad today, but it's worth checking out an episode if you've never seen it for the "interesting" banter between Albano and Wells and to find out what it means to "do the Mario." I already discovered that Mario and Luigi are big Charles in Charge fans just from watching the first episode. Captain N was one of my favorite shows as a kid, as embarrassing as that may be to admit. I wanted nothing more than to enter a videogame just like the main character, fighting alongside Mega Man, Simon Belmont, Kid Icarus, and a Game Boy against villains such as Mother Brain, Dr. Wily, and King Hippo. Though the representations of these characters are nearly vomit-inducing (Mega Man in particular), it's worthy to mention that a show like Captain N that brings so many different videogame characters together will probably never be created again. The Legend of Zelda, which I believe was also a feature of The Super Mario Bros Super Show!, features a wisecracking Link that often utters "Excuuuse me, princess" as he battles moblins and other Ganondorf goons. Really, to be believed these these shows must be seen, so watch a few episodes and marvel at the strange animated past of classic Nintendo franchises. When you're finished, don't forget to do the Mario!